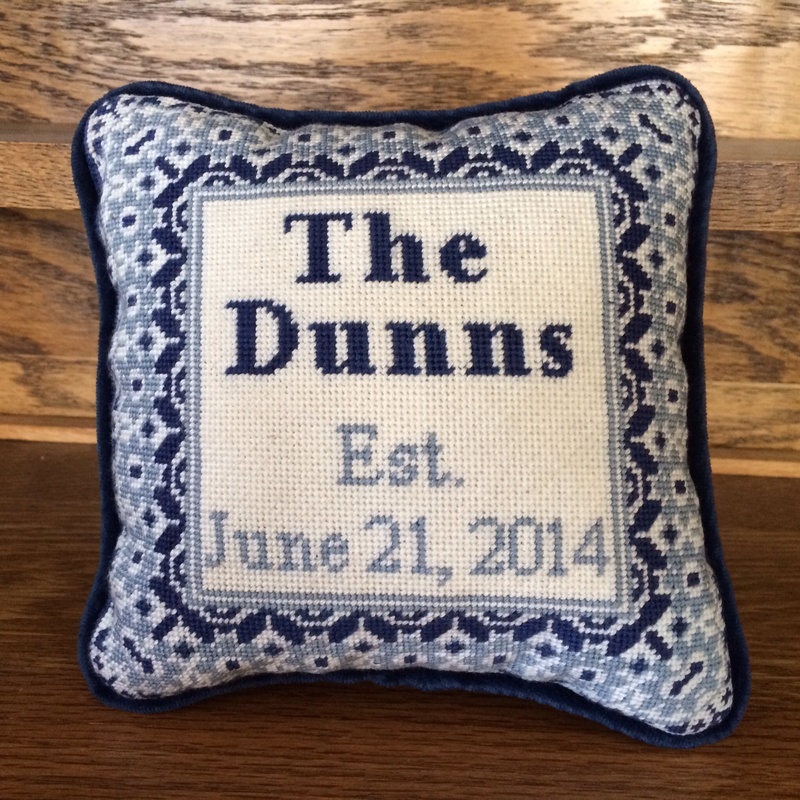 Friday Favorites – Needlepoint Christmas Stockings – Belts – and Weddings! It is friday once again, and this week I’d like to put out a reminder that now is a great time to start your Christmas stockings if you want to be sure to have them ready by this December! We’ve got a few stockings in the works. 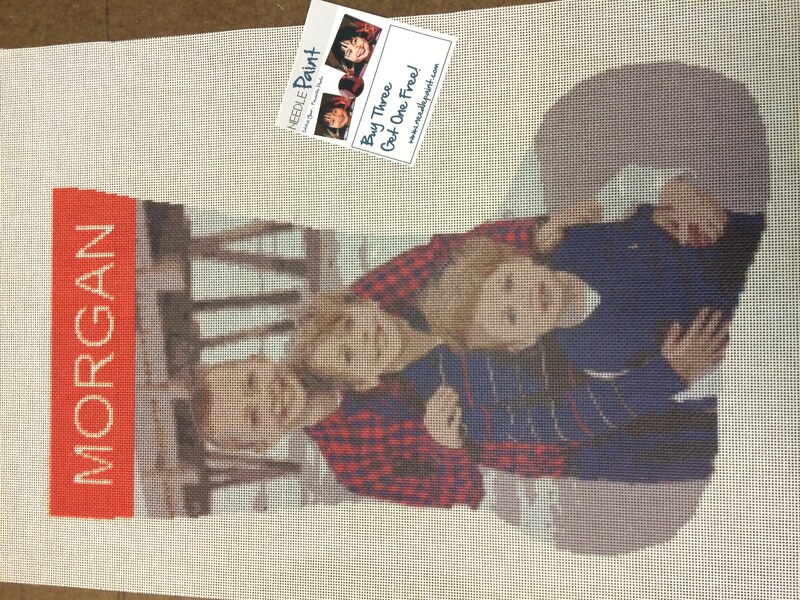 The one below is a fantastic photo that we worked into our Christmas Photo Stocking Needlepoint Kit template. Next up is a beautiful wedding project. It is going to be amazing stitched! 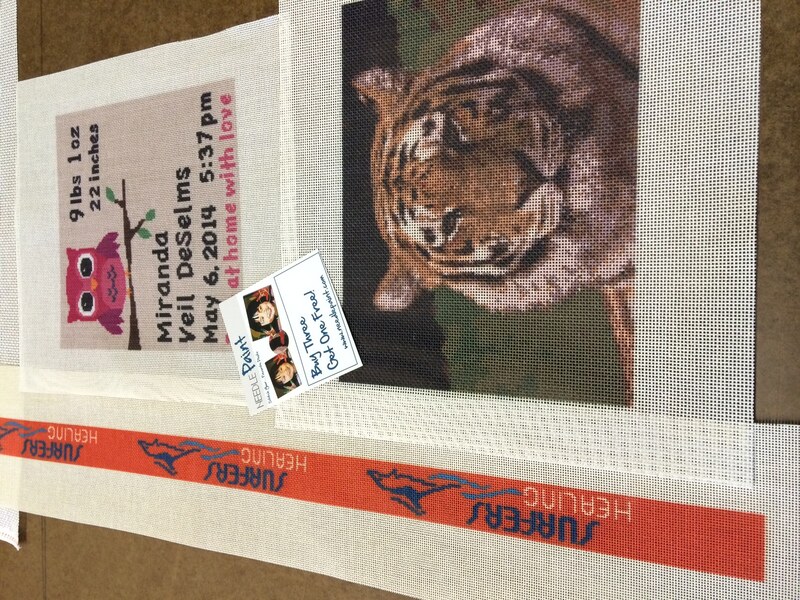 Click here to design your own custom needlepoint kit! 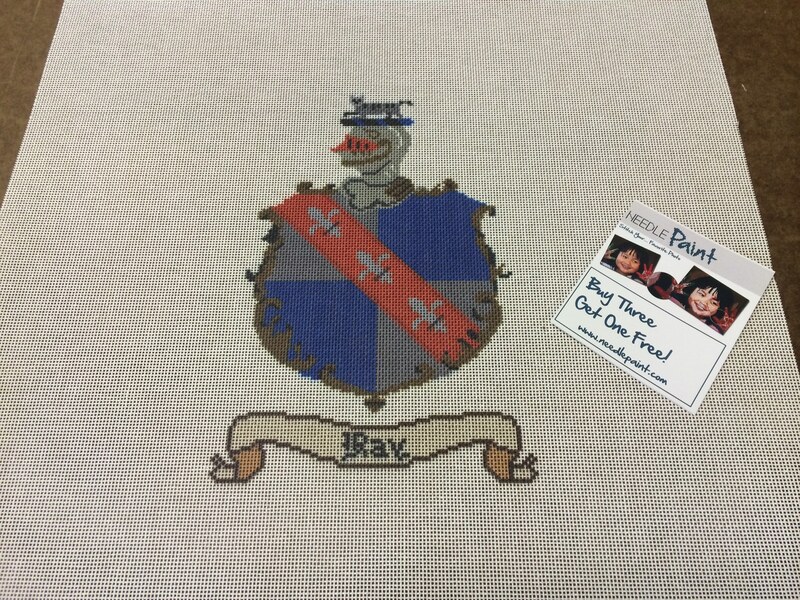 And last but not least, a custom family coat of arms. 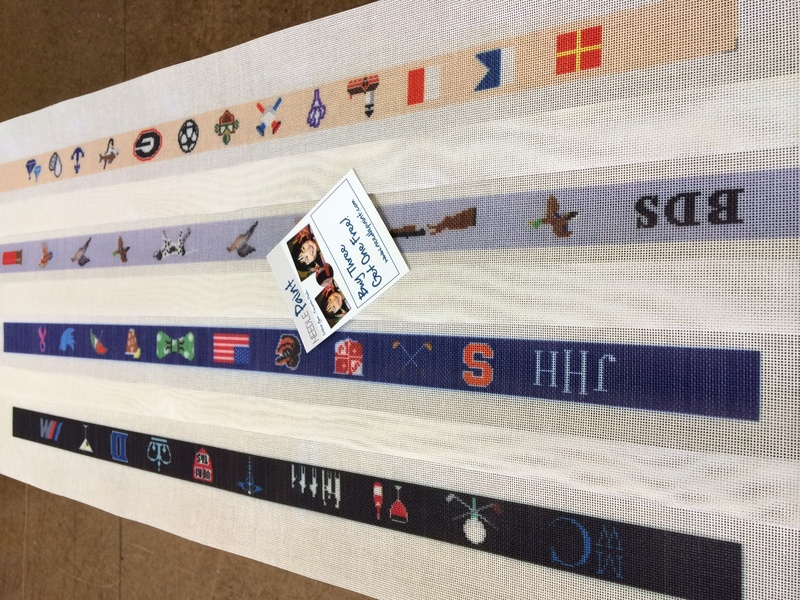 If you follow the blog, you’ll know that we get good feedback, but this blog post is specific to our needlepoint belts. Last week we send out some more belts and our customers were delighted. Here are two testimonial reviews that we got, makes a stitcher feel good! Well, that sums up the whole design process to happy customer. I always love to put pictures in our posts, so below is a photos we took a while back, but you can see newer belts by going through our blog. Friday Favorites – Bow Ties, Marilyn Monroe, Dove Love and More! We’re keeping busy at NeedlePaint, and would like to welcome Karen to our team! She is an expert crafter and is going to help out in the workshop. I’m super excited about this! On to more fun stuff! The projects this week! 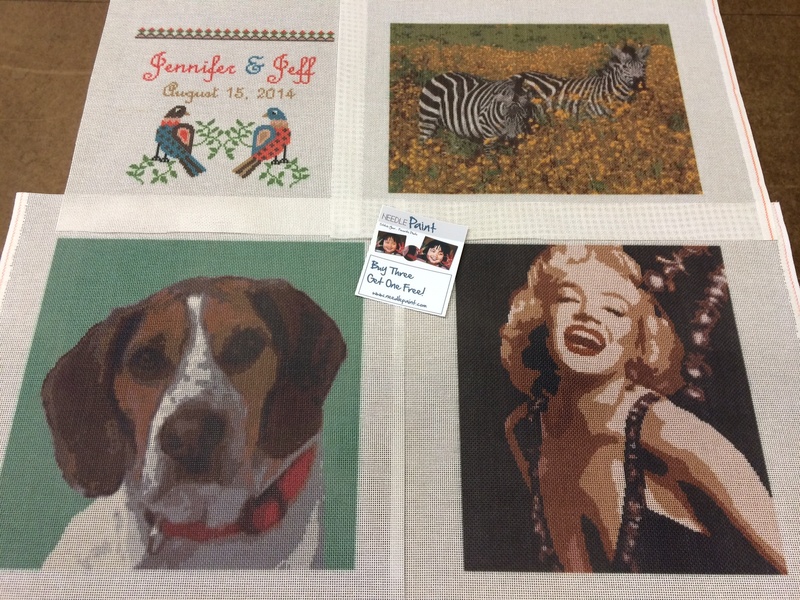 The wedding canvas and Marilyn Monroe design are both in our shop, and the zebra and dog are custom projects we worked on. 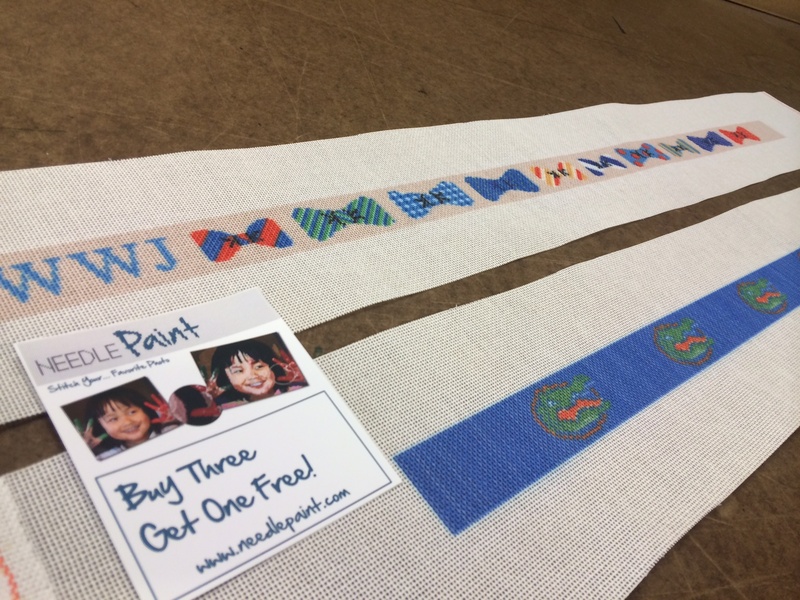 And check out our latest belt canvases, a custom florida design and our bow tie needlepoint belt. 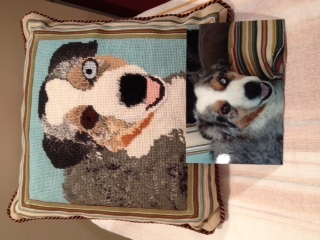 If you look closely, you can see she found the same fabric from dog’s bed that he loved and used it for the pillow! She even put the family’s names into it. Nice stitching Terry! 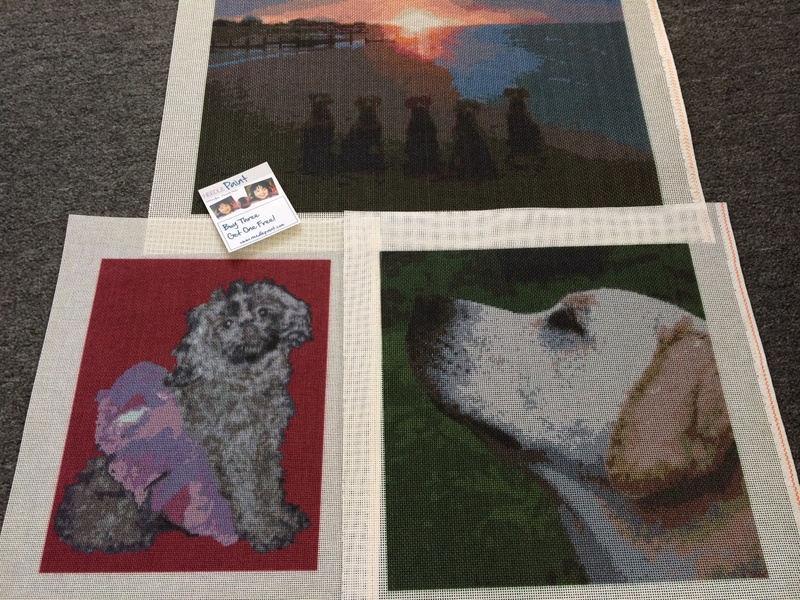 We’ve shown a lot of needlepoint belts on our website, but if you are looking for another fun easy idea for a new project, Kathy at Leatherprize just emailed me some pictures of needlepoint wallets that she finished recently. Don’t they look great?!! 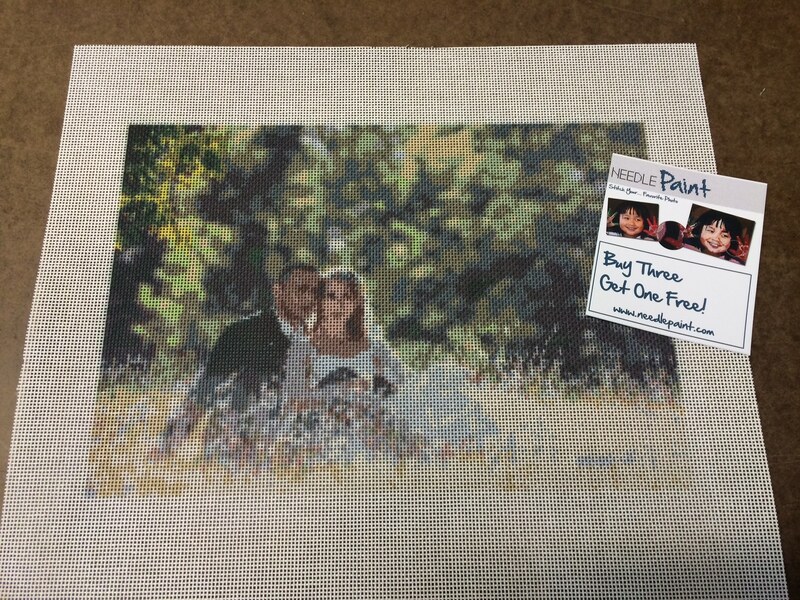 We can design a custom needlepoint canvas for you. 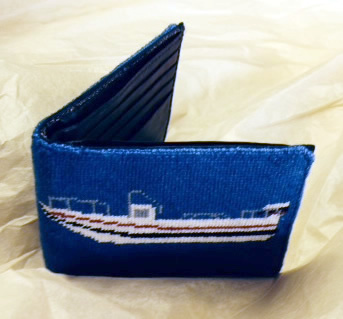 The design size (including an extra stitch to fold the edge over with) is 9.1 x 3.5 inches. Normally you can repeat a design on both sides, or we can do two different designs! 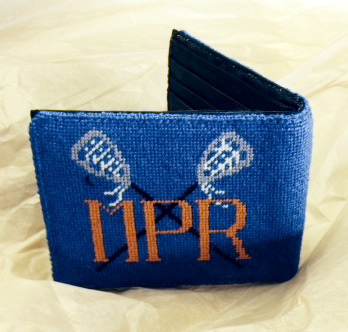 Monograms, favorite sports, hobies, or teams are a few ideas for mens wallets. 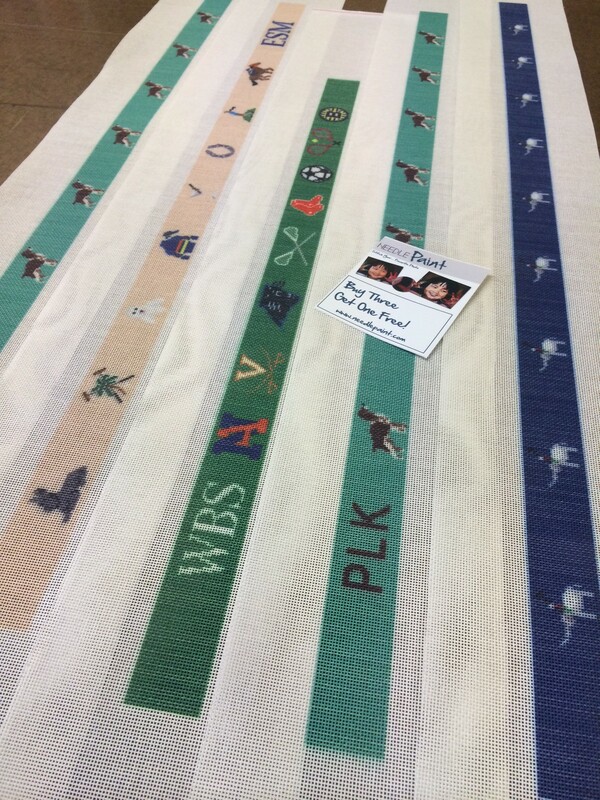 If you are looking for a great needlepoint belt finisher Kathy is your person. We’ve been sending our customers to her and have had great reviews. 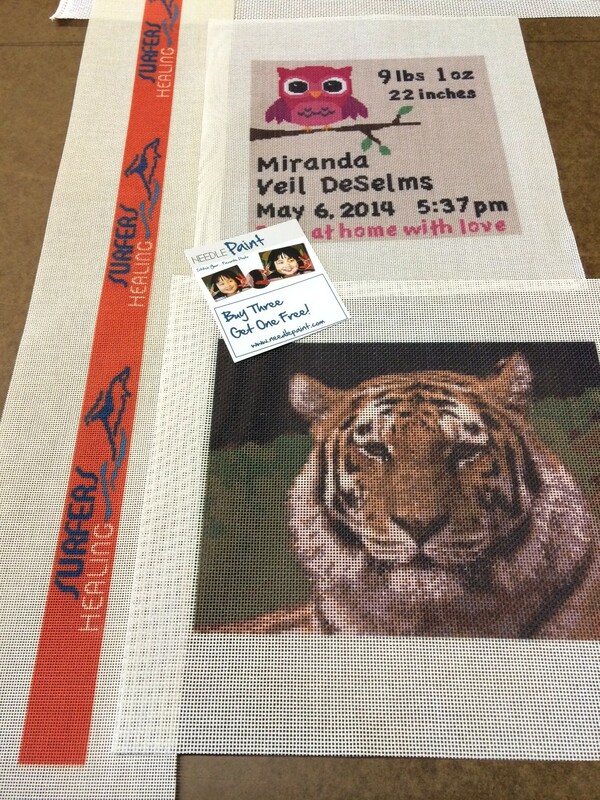 Poke around her website, there are lots of ideas there that we’d be happy to help design the canvas for you to stitch and have her finish. 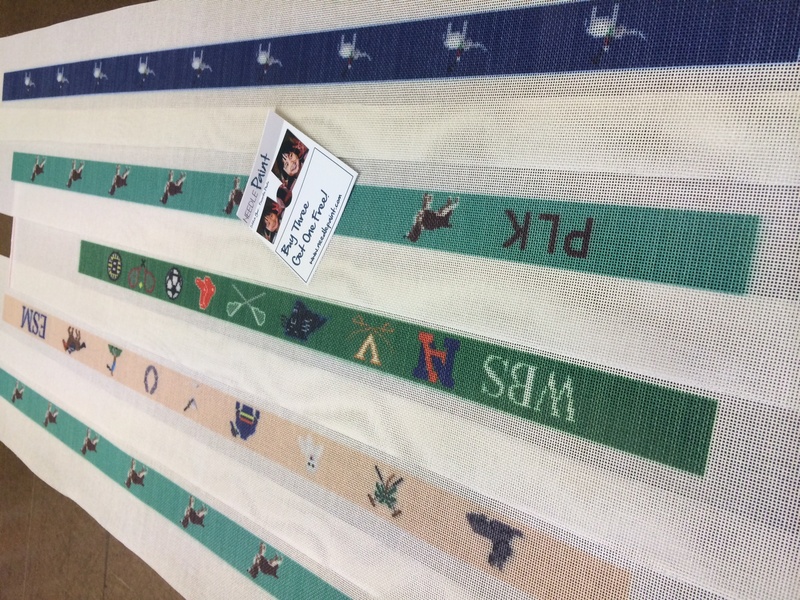 Contact us if you’d like help designing your own needlepoint kit for a belt or wallet. Happy Friday! We’ve got some really great projects this week to share. 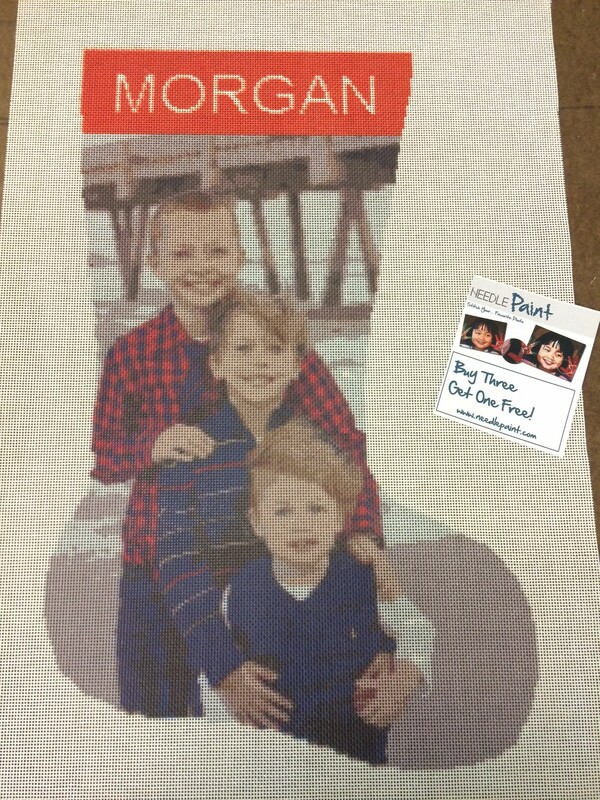 I’m loving the kids needlepoint kits we did this week. They came out great! 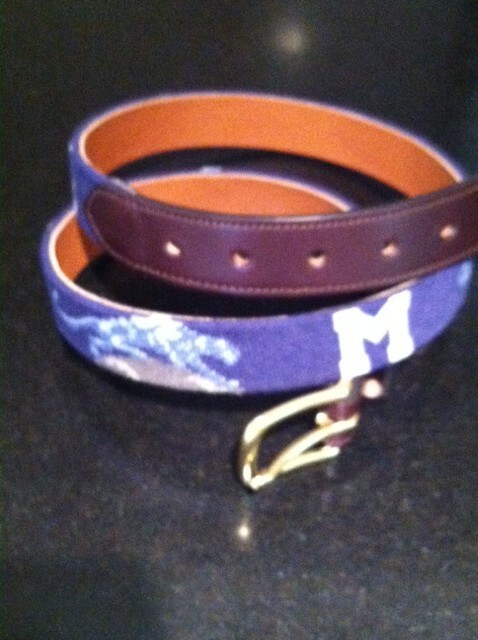 On to some of my favorite projects; custom needlepoint belts. 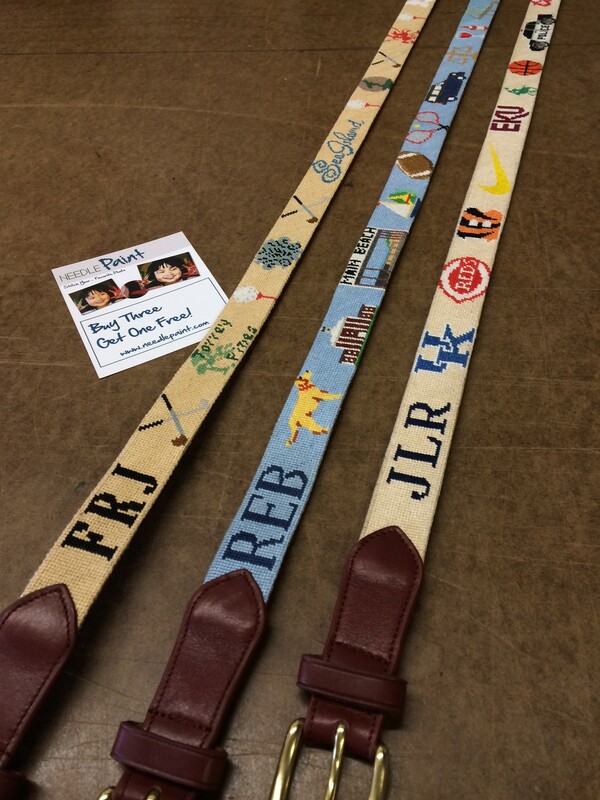 The first photo shows three life treasurers belts that we stitched and the second shows some custom belt canvases we made this week, cool ideas. I really like the stacked monogram, that is a first for us and I think it looks sharp! 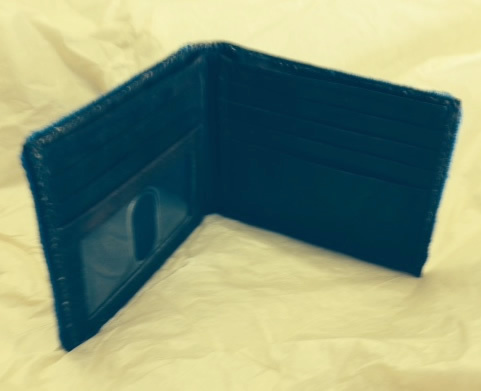 Last this week is a photo from another happy customer! 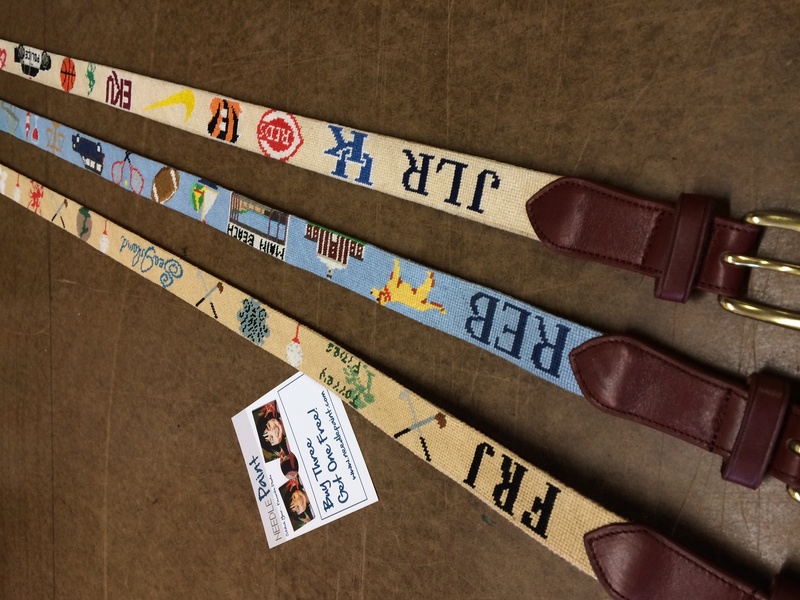 Tracy has really outdone herself recently, with lots of fantastic new needlepoint belt designs! 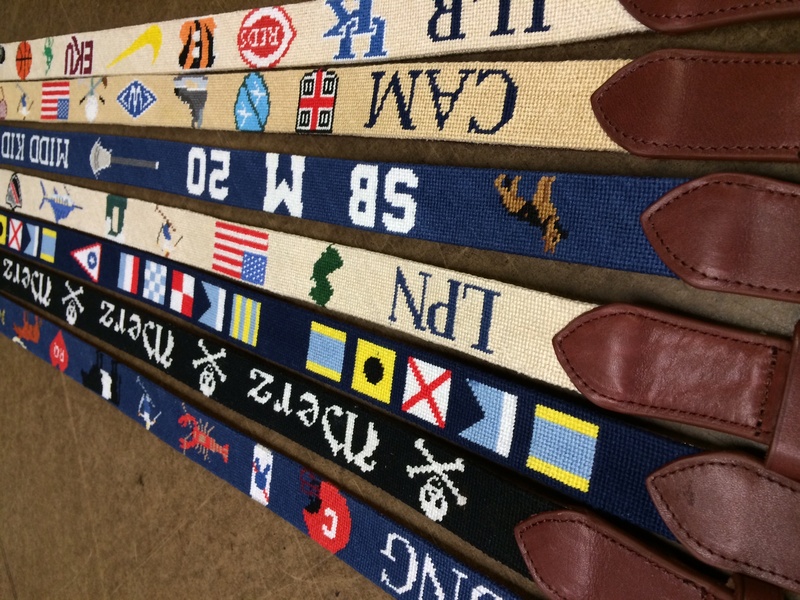 This week we added two new preppy needlepoint belts to our website. Our preppy bow tie needlepoint belt features different sized ties with various patterns and colors. 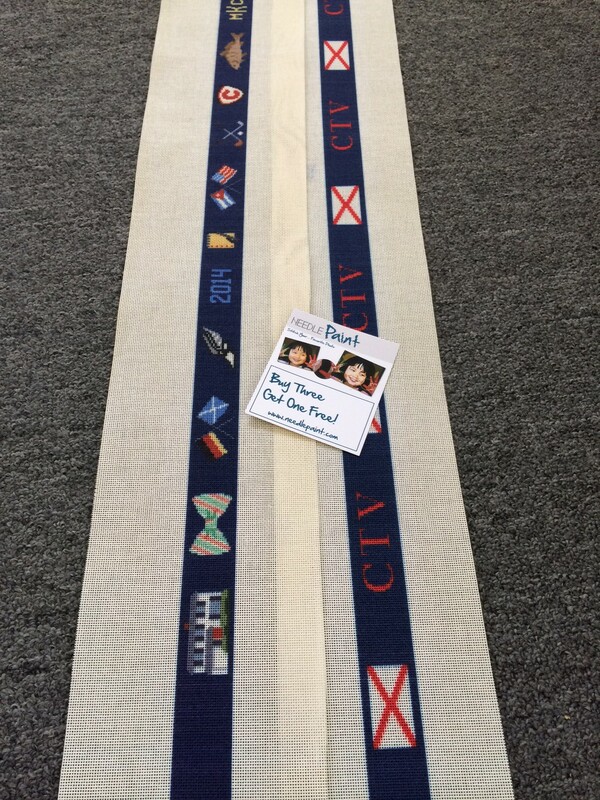 If you’d like to be able to “wear” it on your waist around town we can add a personalized designed tie to this belt! 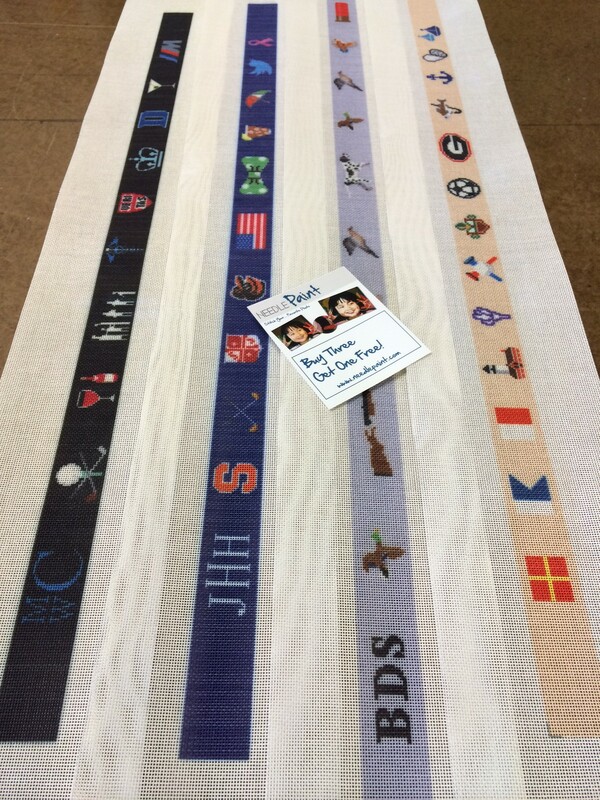 If you’re into coastal history especially around Cape Cod, Martha’s Vineyard and Nantucket, the preppy whale needlepoint belt is a great design. 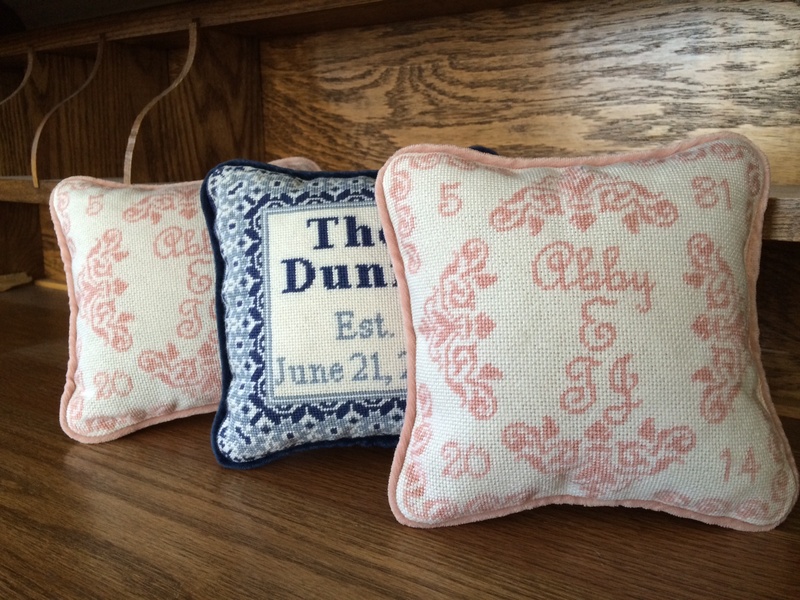 Add a monogram for Free and change colors to suit. This weeks favorites are a bit shorter than normal, as I’ll be posting those canvas images next week. 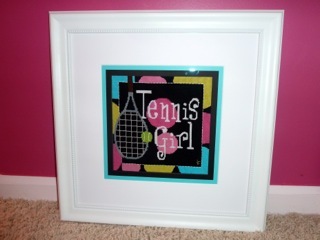 But, we did get some great photos from a customer who finished a really fun tennis project! Here is some feedback we got this week from our customers. 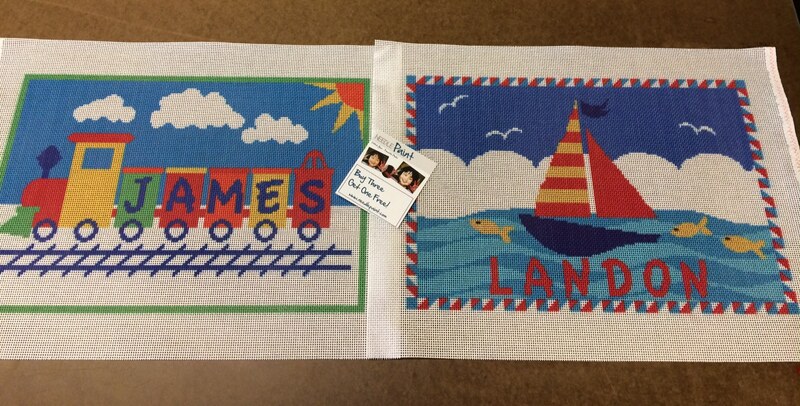 More fun needlepoint projects to come next week! 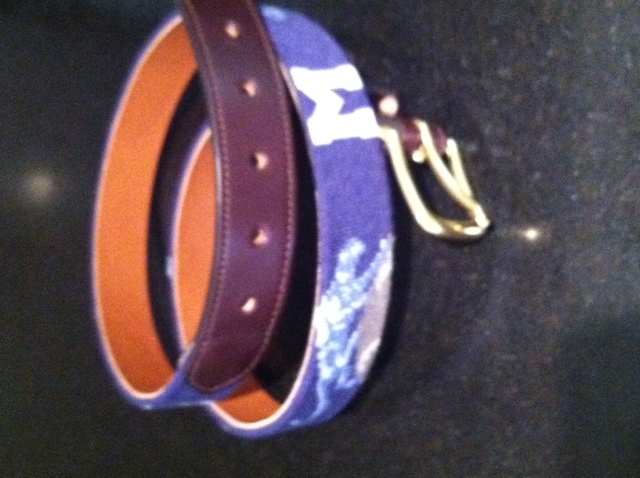 Being a sailor myself, I’m really enjoying two new needlepoint belt designs we put on NeedlePaint last week. 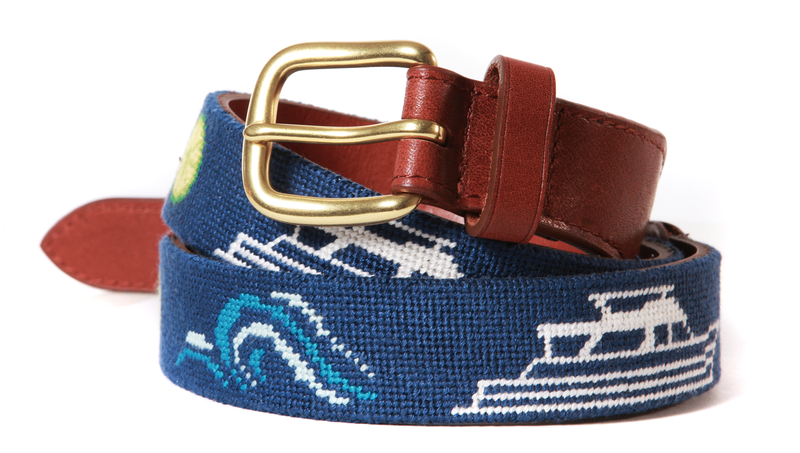 The preppy sailing regatta needlepoint belt features beautiful spinnakers going downwind. The fun colors will draw in the eye, but the tasteful and “fast moving” design will be a hit at the local yacht club. We can even adjust the lead boat to have your spinnaker! 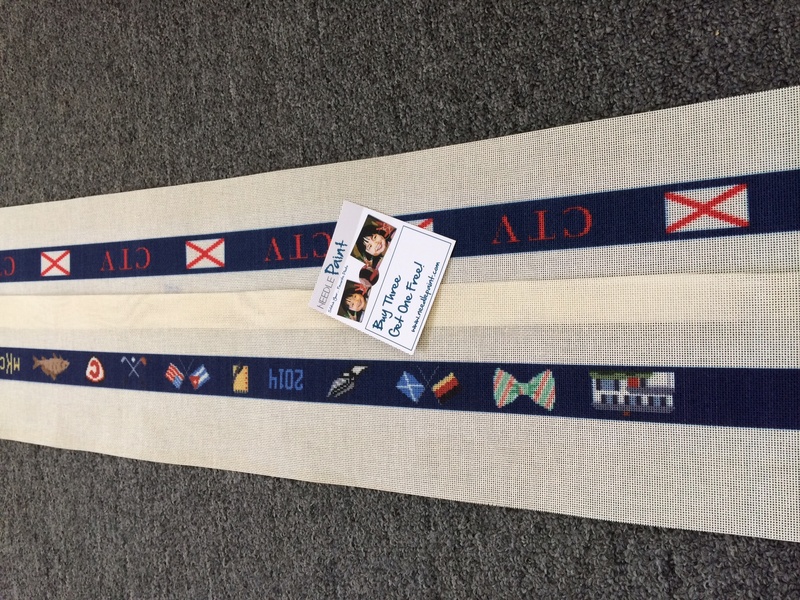 Now, on to another type of sailing, we also created a tall ship needlepoint belt. Classic sailing vessel designs include schooners, cutters, gaff rigs, and even an official full rigged ship. This features a green stripped background over navy. Again, if you know somebody who sailed on a different type of boat not shown, just let us know and we will customize a new boat and put it into the design! 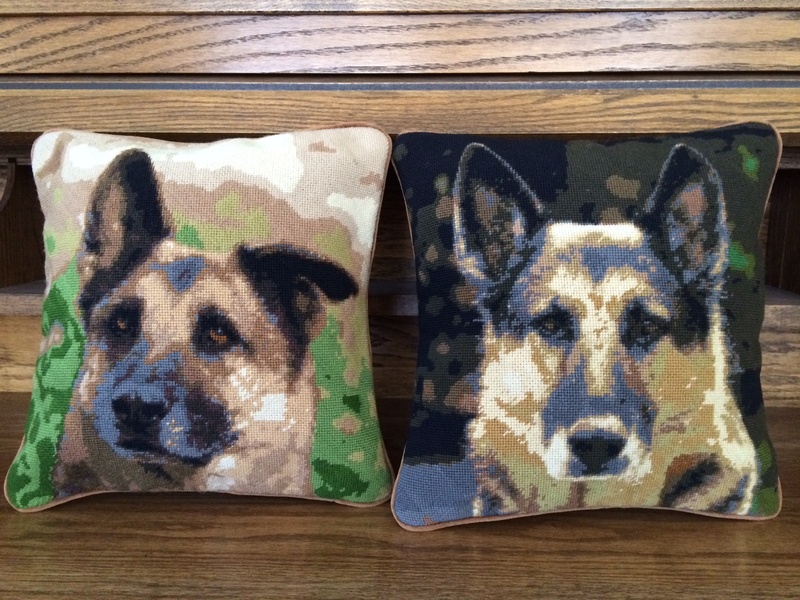 As with all of our designs, both are available as finished belts or needlepoint canvases that you stitch yourself. 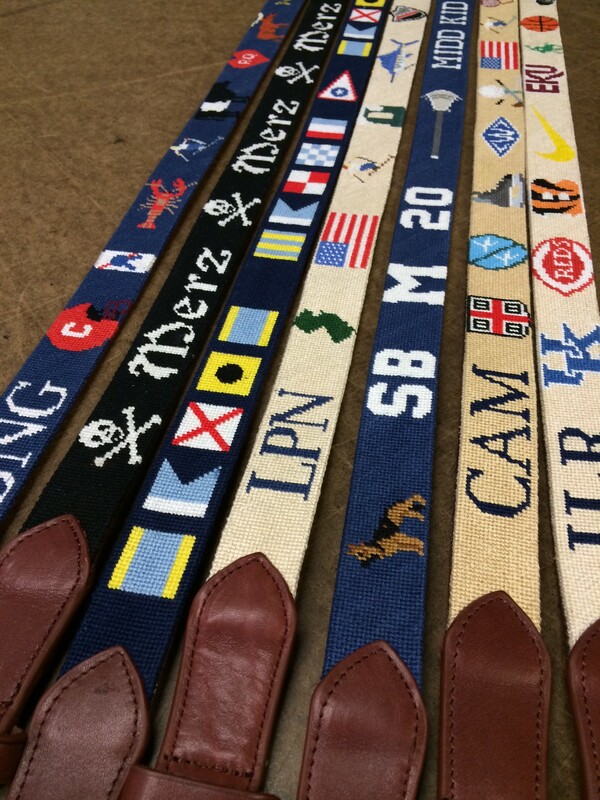 This week we finished 7 custom needlepoint belts. As the saying goes, a picture says a thousand words, and I’m very excited how they look! Hopefully our customers will get some shots out in the “wild”. 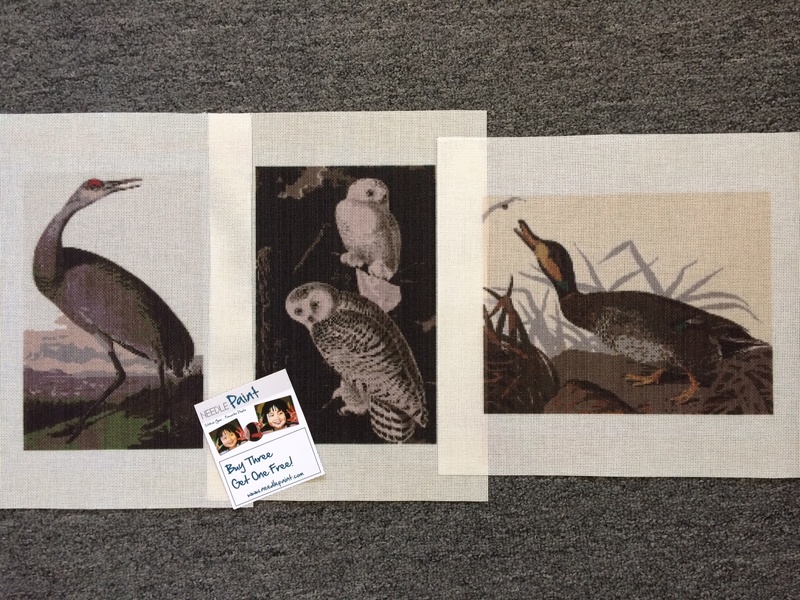 Next, one of our customers is an Audubon fan and loves our stitch counted designs! 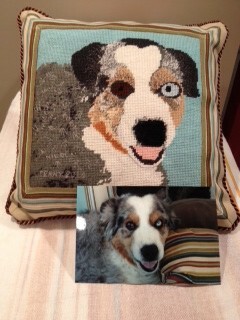 And to follow; more dog needlepoint canvases. Always a favorite of mine, and the yellow lab is available in our shop. 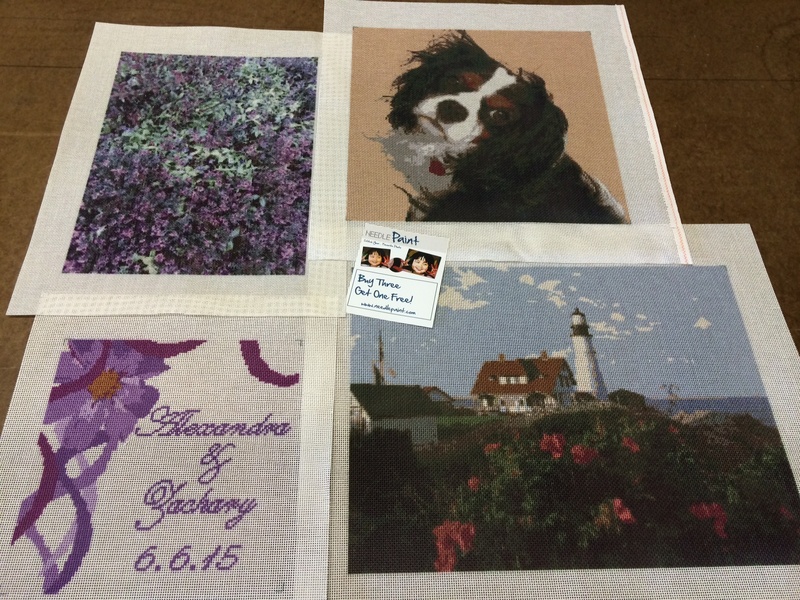 Custom Needlepoint Belt Canvases Right was Designed Stitch by Stitch buy the Customer! Have a great weekend and happy stitching!